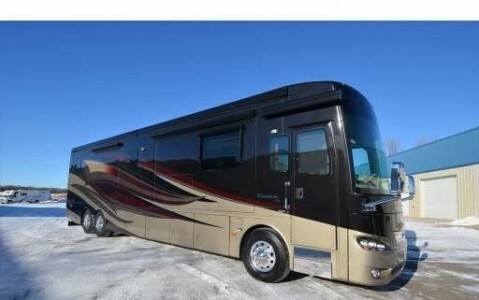 2014 Coachmen Pursuit 27FT Class-A Motorhome. Sleep 6. Purchased new in 2016. Auto leveling. Slide out. Lots of basement storage. Auto awning. Auto drop down bed above driver/ passenger. Cummins QG 4000 Generator. LP gas and Electric. Ford V10. Please call 403-486-0332 to view. 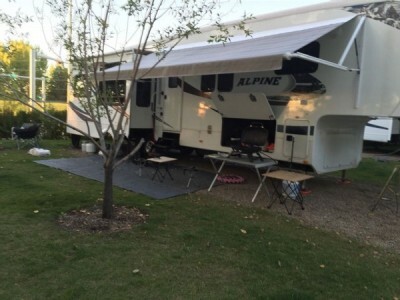 2011 Keystone Alpine 3450RL Fifthwheel. Beautiful 41 ft , 4 slides, Fireplace, Washer and Dryer Hookups, includes club car golf cart and deck furniture!, presently situated on golf course lot at whispering pine resort Pine Lake, lot is also available for purchase or rental. Please call 403-559-7307 to view. 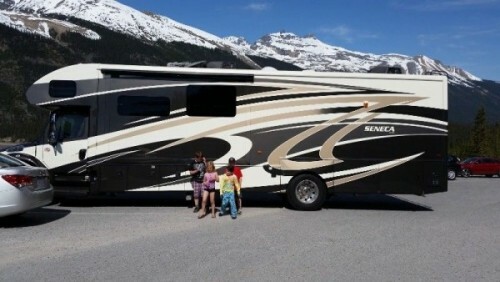 Forest River Sunseeker 3010DS Class-C Motorhome. 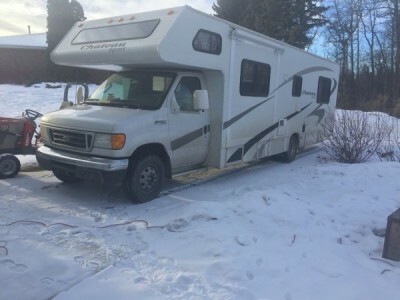 Ford 450 30 feet Solar panel / air conditioner Satellite dish mounted on roof with electric satellite finder 2 Shaw Direct boxes 2 TV’s Slide out in bedroom with walk around bed Slide out with table & couch Sleeps 8. Has back up camera. Please call to view or inquire 403-813-2109. 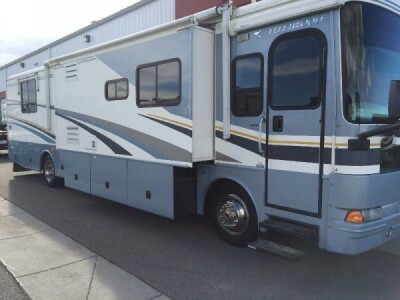 2015 Jayco Redhawk XK29 Class-B Motorhome. 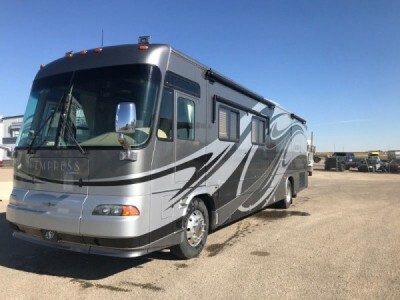 Very clean and well looked after, power step, power awning, large slide, built in 4000 Onan gasoline Cummins genset, rear camera, trailer package, chrome wheel caps, spare tire, For more information, please call 780-686-7987 to view. 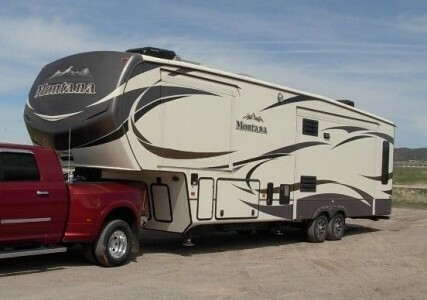 2015 Keystone Montana High Country 305RL Fifthwheel. 12 cu foot French door fridge (lots of room for food/drinks). - 3 slide outs. Queen Bed and Queen hide a bed sofa. 64 gal Fresh Water Tank Capacity (lots of water!). 104 gal Gray Water Tank Capacity. 52 gal Black Water Tank Capacity. Dry Weight 10,120 lbs. Hitch Weight 2270 lbs. 10 gal water heater. 15,000 BTU Air Conditioning. 2 Propane tanks (60 lb capacity). Power vent fan with rain sensor in kitchen. Leather theater recliners. 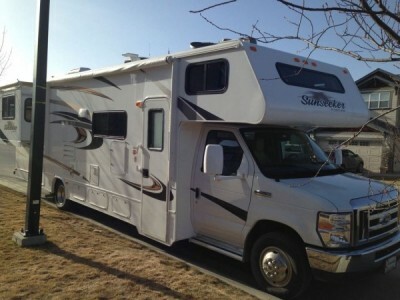 TV/bluetooth/DVD player, insulated enclosed underbelly, electric front & rear jacks, electric awning with LED lights, remote control for slides,jacks,and lights, huge bedroom closet, enormous pass through storage compartment (Lots of storage), option for washer/dryer, has Extended Warranty until March 2022, Ranked #1 5th Wheel RV in 2015 by RVguide.com. We bought a lake lot with a cabin on it last year so no longer need this fabulous 5th Wheel. Like new, excellent condition. Compare the new ones like this for 70k with little or no changes. Please call 780-781-7112 to view. 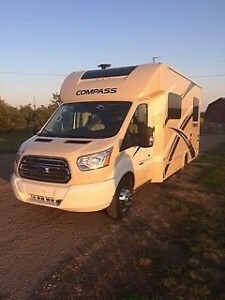 2017 Thor Compass 23TR Class-C Motorhome Brand new, excellent condition. Please call 780-592-2464 to view. 2013 Newmar Essex 4544 Class-A Motorhome. Fully loaded. Spartan chassis/Cummins engine. Amelia exterior design. Ginger glazed cherry high gloss wood. Please call 905-878-5297 to view. 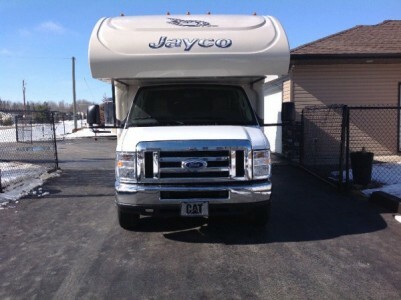 2015 Jayco Seneca 34FS Bunk Model Class-C Motorhome. Diesel. Pet free and Smoke Free. Asking $189,000. Excellent condition. We purchased the extended warranty on the coach portion for 7 years of coverage, ending April 28, 2022 which can be used in Canada and US. See pic for list of what is included in our model!. 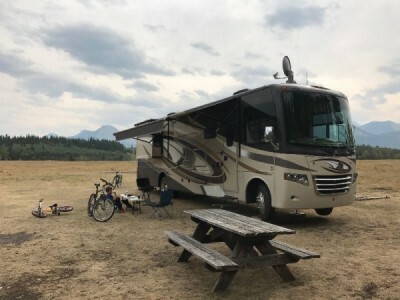 Upgraded Shaw Satellite system, auto leveling jacks, AC, TV in living area, TV/DVD in bunks, TV in Master Bedroom, outside TV/Entertainment, GPS, Backup and side camera, Sleeps 10, King bed in Master with lots of storage, Instantaneous water heater, 1800 inverter, 6.7L 340HP cummins engine, convection microwave, gas stove, 2 slides with awnings, LED lights on awning, Hollywood paint package. Lots of amazing things, and love this motorhome. No complaints at all. Located in Grande Prairie Alberta. No low ball offers please, priced at market value. Please call 780-831-5074 to view. 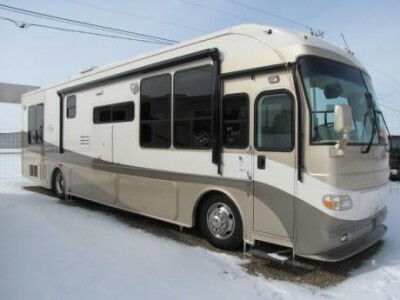 2009 Coachmen Aurora 36Ft Class-A Motorhome. Full body paint. Full wall slide triple. Workhorse Chassis W24 24,000 lbs SSC Limited Edition. Banks Power system and cold air intake and exhaust. 4 wheel disc brakes. Air bag system front and back on suspension. Triple body slide. one piece windshield in mint condition. automatic stabilizer jacks. 2 TVs. leather seating. Backup and side cameras with 7 inch monitor. like new condition. Tilt steering. Cruise control. 8.1L vortec. 6 speed Allison transmission. Exhaust brake. Onan Marquis Gold 5500 kw genset with only 50 hours. Storage and cabinets galore all lighted. Stainless steel appliances. full size fridge/freezer side by side. 10 gallon dsi water heater electric and gas new in June 2016. Aluminum wheels by Alcoa. Chrome heated power mirrors. Cd/Stereo surround sound. Dvd player x 2. Power seats. Sleeps 4. Full awning on passenger side. Corian countertops. Convection microwave. 3 burner stove with oven. captains chairs w shoulder belt. Air ride suspension system. 50/30/20 Smart electrical system centre. Exhaust brake. Towing package and wiring. Spare tire. Rear gas tank filler. Ceramic toilet. Tub/shower combo. Alberta registered and insured. No accidents. Skylight. Smart Power vent fan x 2. Power stairs. Day night shades. Heated tanks. 2 roof ac units ducted air. 2 furnaces. Dash air. Driver and passenger shades. Toyo high end tires new in 2016. High ceiling height of 82 inches interior. Padded insulated ceiling. Body is Aluminum. Sidewalls are fibreglass. Water filtration system. front and rear mudflaps. Queen size bed. Power Inverter. Ceiling fan in bedroom. New stair motor and power gear 2018. Newer batteries. Please call 403-607-5220 to view. 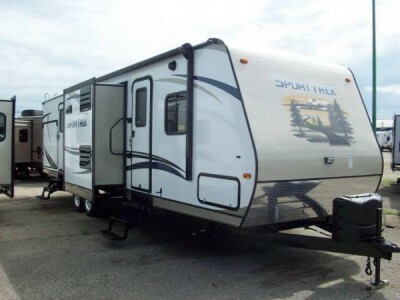 2014 Sport Trek 320 VIK Fifthwheel. Amazing floor plan and in excellent condition, sleeps 8-10 easily with 4 bunk in the back room alone. Outdoor kitchen, outdoor shower, power tongue jack, electric awning with LED lighting, remainder of 7 year extended warranty, sway pro hitch, bike rack on rear. Ultimate family trailer. This trailer retails new for $45,980 new. We have taken very good care of this trailer and have only used it maybe 12 times. (Photos are stock images as our trailer is parked where we can't put the slides out to photograph it properly.). Please call 587-227-4918 for more info. 2007 Forest River Work and Play Fifthwheel. Sleeps 10, 12Ft Garage, New tires, Battery, 2 Bolbs pecton, AC unit, Zip in screen. Please call 403-820-2238 to view. 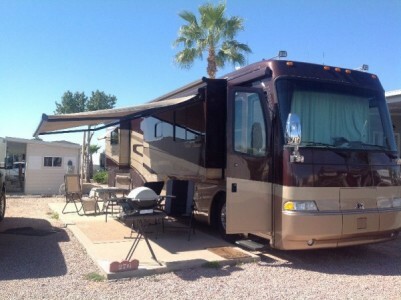 2005 Fleetwood Bounder 38Ft Class-A Motorhome. 300 Cat Diesel. 3 slide outs. 8000 Cummins Generator with only 400 hours on it. New alternator. New coach and chassis batteries. New tires. New Shaw automatic satellite dish. Auto leveling. 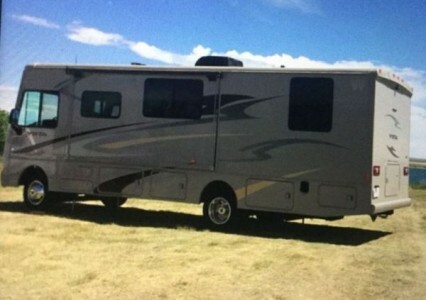 Motorhome has been completely gone through and fully inspected by High River Autoplex & RV. Very nice Coach and ready for the spring! Phone Colt 403-820-2238 for more details. 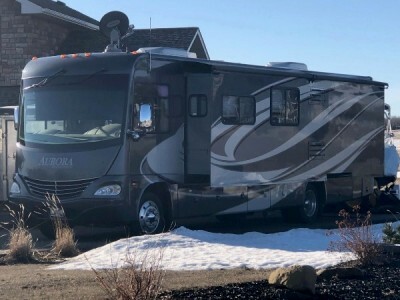 2005 Beaver Patriot Thunder 42Ft Class-A Motorhome. Beautiful deluxe unit with solid cherrywood, King bed, stacked washer/dryer, full size fridge/freezer with ice/water, 2 TVs, and much more. CAT 525 C13 engine, tag axle, 4 slide outs, Roadmaster Chassi, 4000 Allison Transmission, 3 AC units, 10 KW generator, Aqua Hot heating/hot water system. This unit has been well maintained. Dry country. Priced to sell!. Please call 204-479-3640 to view. 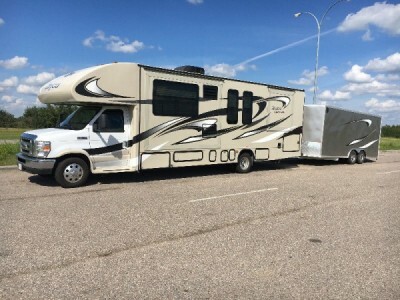 2015 Thor Miramar 34 Class-A Motorhome. You would not have to worry about anything with this purchase, it is a house on wheels. auto start cummins 5500 on board generator, automatic satellite, auto leveling, TV on outside with surround sound. Two bathrooms. Must see! Please phone 780-862-3778 to inquire. Have financing source if needed. Please call 780-862-3778 to view. 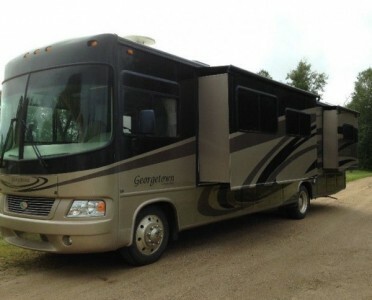 2006 Triple E Empress 39Ft Class-A Motorhome. It is finally time to sell the bus! 2006 Empress in excellent condition, always stored indoors. 39 feet long. Bought new, original owner. Fully loaded, Automatic satellite dish. Leather furniture. Cherry wood cabinets. Carpet & heated tile. Side by side fridge freezer with automatic ice maker. Dual air conditioning. Central vac system. 400HP Cummins diesel pusher. New Michelin pilot tires 275/80 22.5. 10 gallon hot water tank. air ride, self levelling jacks. 7500W Onan diesel generator. 2 slideouts. Must see to appreciate! If you have any questions, please call 780-814-4810 to view. 2013 Winnebago Access Premier WR226QP Class-B Motorhome. Like new condition, Two trips to BC. Ford E450, 6.8L, V10, Super Duty. Sleeps 6, Queen Rear Island bed, Bunk over cab. 4000 watt onan micro quiet gas generator. Vented roof air conditioner. Electric awning. Rear camera, Rear air springs, Exterior wash station. 2 TVs with remote, Radio, Satellite, AC, Stereo sys. Video sel. Windows dual pane, Microwave / convection oven. Booth Dinette slide out, Cab Leather swivel seats. 3 Burner range with oven, 2 door large fridge. Night shades, Power vents and other extras. Lots of inside & outside storage, Large trunk. No text message or email, Selling for health reasons. If interested call 403-358-4123. 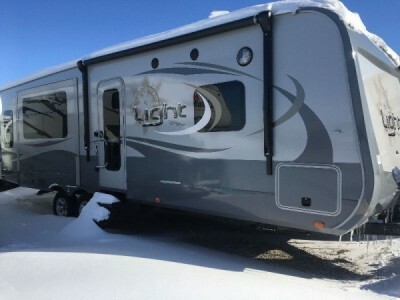 2016 Open Range 275RLS Light Trailer. I am selling my 2016 Highland Ridge camping trailer with everything included, (pots, pans, dishes, jack stands, wheel chocks). It has a shower and comfy master bedroom with a queen size bed, and a pullout air mattress that plugs in to inflate. 2 reclining chairs, full couch, fire place, 20 inch TV, DVD player, satellite connection. 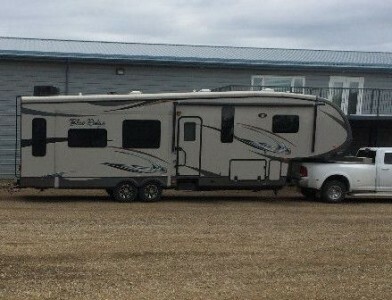 This is a 27 foot trailer with 4 season package (can be used in winter), and 2 slide outs. I am looking to sell my trailer with my 2011 Ford F-350 King Ranch, so it can literally be hooked up and ready to go immediately. Please call 403-472-6975 to view. 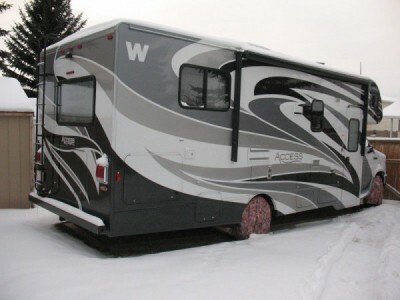 2006 Four Winds Chateau 29Ft C-Class motorhome. 30 foot long. Brand new complete roof membrane and awning installed by Arrkan (tree branch damage). Generator, fridge, freezer, stove, AC, TV capability/wiring, indoor and outdoor showers, bathroom, queen bedroom. Sleeps 8. Tow hitch. Mechanically sound. Just get in and go! 35K obo. Please call 780-660-9510 to view. 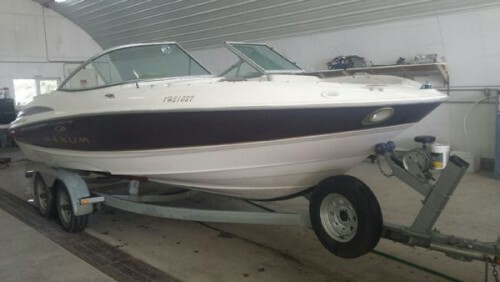 2000 Maxim 2100 SR Boat. Bimini tops, Stainless props. 5.0L Mercury Inboard 225HP. Excellent shape. All fun stuff includes skis tubes. Please call 403-801-6621 to view. 2014 Forest River Blue Ridge 3025RL Fifthwheel. 38ft. Has king bed, plumbing for washer/dryer, (never installed), central vac with 3 slides. Trailer always parked in heated shop. 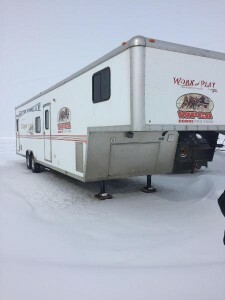 Trailer only used 3 weekends/year, once in 2017. Located near Borden, SK. Please call 780-718-8352 for more info. 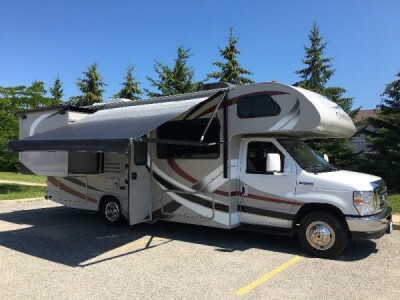 2015 Jayco Greyhawk 31DS Class-A Motorhome. Like new, hardly used. Warranty on chassis still. Ford v-10. 2 slides, self levellers, tons of storage. Private sale, no gst. Will look at small trailer as part trade More pictures on request. Can sell with a all aluminum trailer that matches for an extra fee. On board Oman generator with upgrade 6 volt coach batteries. Please call to inquire 780-933-7697. 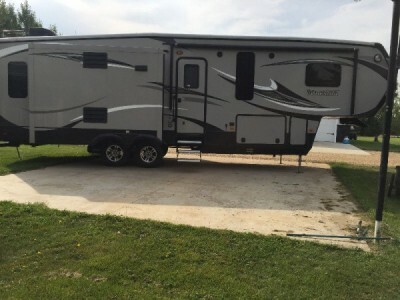 2015 Heartland Road Warrior 420 Toy Hauler. 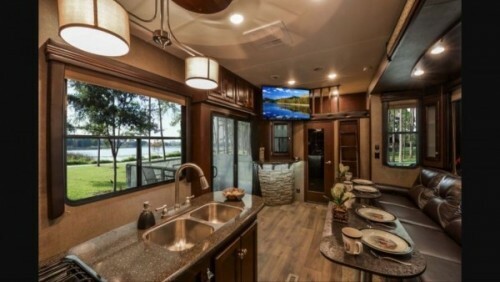 Sleeps 7, twin air conditioning, 2 bathrooms, king size master bed, 2 power slides, 2 power awnings, 2 fold down decks with screen doors, huge reclining/vibrating leather sofa, double door fridge, outside fridge, fuel caddy, and the list goes on! Beautiful condition, used very little. Hauled once to the lake lot. To inquire please call 780-919-0282. 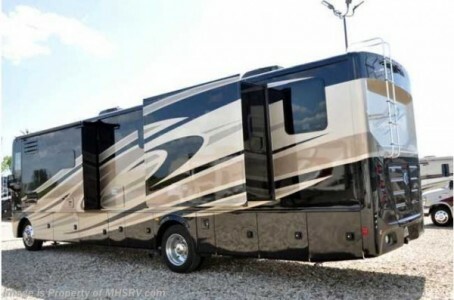 2014 Thor Chateau C-Class RV. Kept indoors all winter. 2 Flat screen TVs. Bike rack. GPS. Spotless. Non-smoking. No pets. Great condition. Sleeps 8. Low mileage. Call to inquire 416-518-0034. 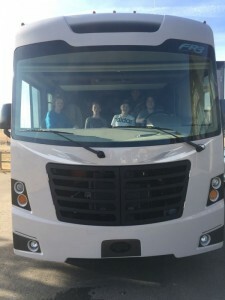 2015 Holiday Rambler Vacationer Class-A Motorhome. Only 16,000 km (Approximately 10300 miles), Mint condition, has Queen bed, exterior entertainment system. Has diamond Kote protection plus SAL protection plan. Ready to go! Call 613-222-0257 to view.